Latest Govt Jobs in Jharkhand High Court 2018 – Here comes the latest Government job applications for all fresher candidates who are looking for the Govt jobs in Jharkhand state. 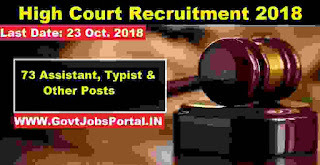 All fresher and young candidates are invited for the following posts as mentioned below in this article after this introduction paragraph related to this High Court recruitment 2018. We took this information from the official website of Jharkhand High Court and shared with you here. We also shared that official PDF file under IMPORTANT LINK section at the last of this article. So those who wants to check the official detail and the link for applying online for this High Court Recruitment process 2018 can check that section at the last of this article. More information related to these Latest Govt jobs in India is given below, so read the article carefully before moving to online application. Education: Applicants who have completed their Graduation in any stream and have good knowledge of computer can apply for these Assistant posts in High court of Jharkhand. Education: Those who have completed their Graduation in Library Sciences can apply for these posts. Education: Those who have completed their Graduation in Commerce/Economics stream can apply for these posts. Education: All Indian fresher Graduates in any stream can apply for this post. Education: Graduate in any Stream. Education: Graduate in any stream and have typing speed of 40 Words per Minute can apply for these posts. Age Bond: Must have age in between 18 years to 35 Years for applying the above job profiles. All eligible and interested applicants for these high court jobs can apply online through the official website. There is no other procedure for applying this High Court Recruitment process. 8th Oct. 2018 is the opening date to apply online through the official website of High Court of Jharkhand. The link for applying online will remain activated up to 23rd Oct. 2018. So apply online before this date. Check the IMPORTANT LINK Section below for more detail. 23RD Oct. 2018 is the Last Date to apply.